Robert William Walsh receives funding from the Science and Technology Facilities Council, UK. If you’ve never seen a solar eclipse before, you should make an effort to witness the breathtaking event on August 21. While only people in the US will be able to see the total eclipse – in which the moon completely blocks the light from the sun – those living in parts of South America, Africa and Europe should be able to see at least a partial solar eclipse. Solar eclipses occur when the moon passes between the Earth and the sun so that it blocks part or all of the sunlight as viewed from a particular location on our planet. Earth is the only planet in the solar system where this can happen in this way. This is because of the moon’s size and its relative distance from the sun – when viewed from the Earth, it can identically cover the bright solar disc to reveal the tenuous, wispy outer atmosphere of the star (called the solar corona). An eclipse does not happen every time the moon travels around the Earth. This is because its orbit has a slight inclination (about five degrees) relative to our planet’s journey around the sun. However when aligned correctly, the result is an awesome, emotional experience. Once the eclipse has begun, the moon continues to eat its way across the blazing sun before darkness falls, the temperature drops and the sky is dominated by a radiant crown around the moon. It happens approximately every 18 months. On August 21, the moon’s shadow will travel west to east, touching land at Lincoln Beach, Oregon at 09:05 Pacific Daylight Time before speeding across North America at up to 1km per second and finally exiting close to Charleston, South Carolina, at 16:09 Eastern Daylight Time. The longest total eclipse will occur close to the town of Carbondale, Illinois – lasting about two minutes and 40 seconds. Anywhere within the 110km wide path of the eclipse, observers will be able to see the sun completely covered. Outside of that, sky-watchers will still see a partial eclipse with decreasing percentages of the sun’s surface covered as one moves away from this narrow corridor. It is estimated that over 12m Americans live in the path of the total eclipse itself and another 200m people within a day’s drive of it. This is science engagement on an unprecedented scale and is likely to be the most orchestrated eclipse viewing event ever undertaken. Social media activity has been increasing for months now, building up the anticipation to be part of this rare event. Expect Twitter, Facebook, Snapchat, Flickr and Instagram to be swamped with eclipse pictures during and after the event. In fact, the eclipse should be one of the most digitally recorded events ever, which could be of use to scientists. 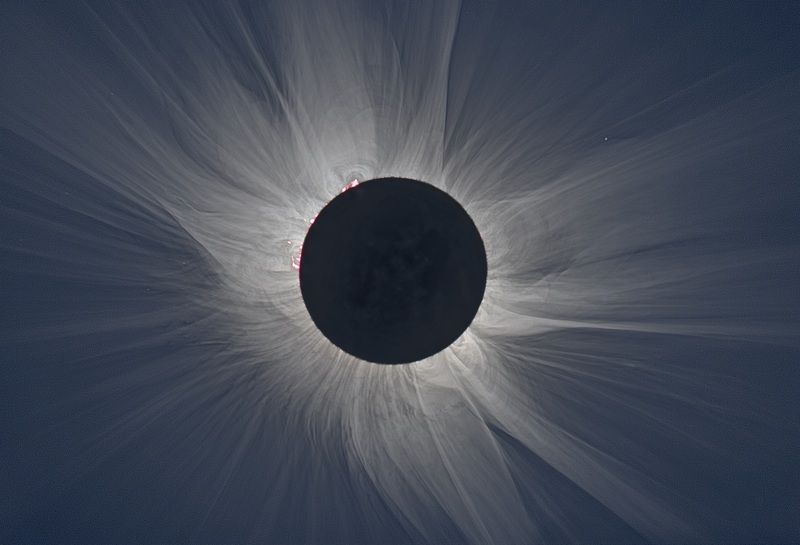 The Citizen CATE (Continental-America Telescopic Eclipse) experiment aims to capture images of the inner solar corona using a network of more than 60 telescopes operated by citizen scientists, high school groups and universities. Similarly, the Eclipse Mega-movie is asking observers to use their app to upload eclipse images along the path of totality to produce an expanded and continuous film of the total eclipse as it crosses the country. Both of these experiments will produce unique data-sets of the white light corona, a region that is usually impossible to observe because the exceptionally bright solar disc hides it from view. We will be able to examine like never before the detailed structure of the solar corona and how it is dragged out into space by the solar wind. There is also a big focus on education. A top priority is making sure that people know how to safely view the eclipse. Looking directly at the sun is unsafe except during that brief period of the total eclipse. It is vitally important that only special solar filters, such as certified eclipse glasses, are used. Unfiltered cameras, telescopes, binoculars or other optical devices concentrate the solar rays and are a definite no-go in regard to eye safety. If no filters are available, it is best to use a pinhole camera to project the eclipse indirectly. It is also important to take advantage of the amazing opportunity to inform a huge population about the science behind the event. There are thousands of astronomy-oriented events, parties even, being hosted along the path of totality. Scientists are equally excited. Eleven NASA and NOAA satellites, high-altitude balloons, hundreds of ground-based telescopes and even the International Space Station will all take advantage of this unique shadow-chase across the surface of the Earth. However, it is not just looking up at the moon and sun that is important. Total eclipses also provide us with an unprecedented opportunity to examine our own planet under quite unusual conditions. NASA says that observers across several states will measure the radiant energy from the sun into the Earth’s atmosphere from the ground as well as from space. This should provide new insights into how the incident solar energy in our atmosphere changes when particles, clouds and in this case the moon, prevents sunlight from reaching the surface of the planet. I will be fortunate enough to be part of a four-hour live online telecast of the eclipse from Carbondale via NASA’s video podcast EDGE. This will include interviews with scientists and live panel questions, high-resolution sun images and a balloon launch. As a solar physicist who can only usually observe the solar corona from space by satellite instrumentation, it is special to be able to glimpse the corona with the (protected) naked eye for a brief time. One interesting part to all this is the fact that the US gets another chance in seven years to maximise the opportunities that the eclipse brings. It is said that one of the longlasting legacies of the Apollo missions to the moon is the number of American scientists today who were inspired to be engineers and scientists. Though this solar eclipse is science engagement in a different manner, the end goal is the same – bringing about not just a greater appreciation of the Earth, and solar or lunar research, but also sparking a desire in many young people to be the science leaders of the future.